The A.I. revolution is underway and there's no mistaking the leader beyond the move, Nvidia. The Nvidia (NVDA - Get Report) GTC conference kicked off this week in Washington D.C. It's D.C.'s largest A.I. conference and with Nvidia playing host. There are many uses of A.I., and that goes way beyond cars. There are also several players, but the host seems to have taken the lead. TheStreet has long covered Nvidia. Take Eric Jhonsa reporting on the company's new GPU products and breaking down CEO Jensen Huang's keynote presentation at the Consumer Electronics Show. Or my chats with key members of Nvidia's autonomous driving team as the company leads the way in disrupting the transportation sector. But after only a few hours in D.C., it's clear that Nvidia's doing more than that. It's not just participating in the revolution of artificial intelligence, it's a key player leading the way. The exact reason why is rather complicated. The simple answer? Artificial intelligence commands an insane amount of power. Whether that's piloting an autonomous vehicle or categorizing CT scans for radiologists and doctors. Thanks to Nvidia's GPU technology, the time and power that are needed to process this data are greatly reduced. What was previously impossible, thanks to the sheer size of this data, Nvidia is making a reality. But what exactly is "A.I." and how does it affect our everyday lives? Artificial intelligence, in some capacity or another, is used or will be used in virtually every industry. Ranging from healthcare, transportation, online shopping, logistics, video streaming, agriculture and even social media. In social media, A.I. used to link friends, create predictive text and match faces. On Netflix (NFLX - Get Report) it's used to suggest content viewers may like based on prior selections. In agriculture, autonomous drones can cover vast areas of farmland to determine what specific areas need. More water? Less pesticide? Farmers have seen a 90% decrease in pesticide use and a 10% boost to crop yield as a result of A.I. Autonomous drones have other uses too, such as inspecting oil rigs. Using various cameras, the drone can detect issues. Drone solutions can increase inspection speed by 25%, while also reducing annual maintenance cost by 25%. In healthcare, a radiologist may see 8,000 images a day. 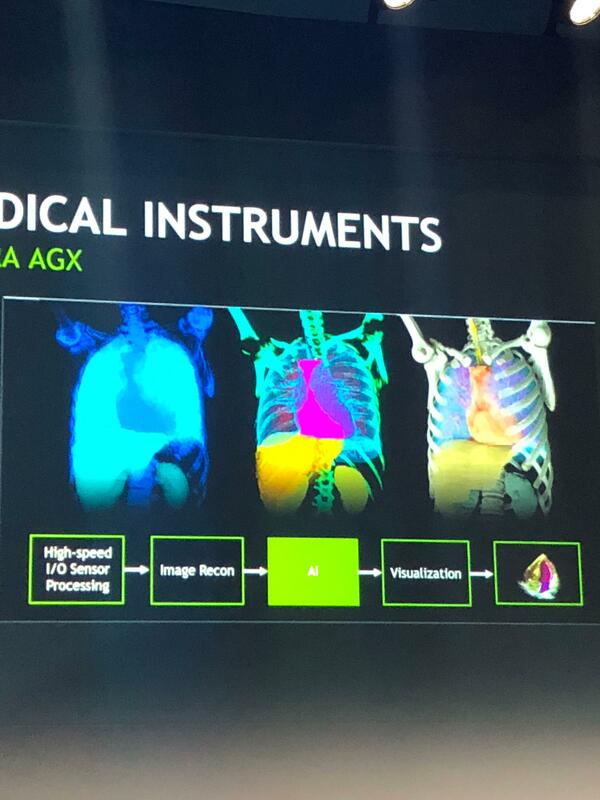 And while Nvidia's GPUs can significantly improve the quality of medical device scans (as shown below), A.I. solutions can also significantly reduce the burden of sorting through those images. So where does this leave Nvidia? Every task, be it strawberry picking or helping first aid responders during a natural disaster, this company is bound to play an important role. From a stock perspective, Nvidia has seemingly been caught up in the pounding of chip stocks. But Nvidia isn't a standard chip company and while A.I. isn't exactly a new concept, it's still in its infancy today vs. what it's potential is tomorrow. Companies like Nvidia will make these once-impossible tasks possible, and do so much sooner than many investors and consumers realize. Whether that's in healthcare, transportation, agriculture or shopping on Amazon. So, while companies like Cisco (CSCO - Get Report) , Microsoft (MSFT - Get Report) , Hewlett-Packard Enterprise (HPE - Get Report) and hundreds of others are working on specific uses or applications, Nvidia is bringing a wide swath of solutions thanks to its advanced hardware and various development tools.